So! A while back we bought into some portion of a cow. And as you know, if we were not intended to eat cows, they would not have been made of delicious steak. However... a small part of them is made of liver. I can handle a small amount of liver, but I'm not a huge fan. The Wilsons also had a slab of liver with which they needed to do something. Rumors abounded about the one meal that registered as tasty: Leberknödelsuppe. Bavarian liver dumpling soup. So I'm game. Anything "dumplinged" is better than it was in its original state. And seriously, what was I gonna do with a three and a half pound slab of liver... SO! I donned the nearest thing I could find to "liver grinding" attire. Next, grinding up the pieces. It was just a wee-bit "Fargo." Bread, eggs, onions, garlic, parsley, marjoram... the more stuff, the better! The final product! 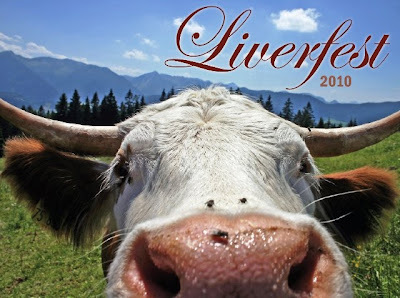 Liverfest is a little like tuna canning...or deer carving... You aren't likely to try your creation for MONTHS afterward. I'll report back on the success of Liverfest 2010!! Okay, so all I can say is...YUCK!!! I don't even want to know how it tasted. I used to like liver when I was a little kid, but now I completely abhor it. Ooops, anonymous would be the Wenatchee folks. But I think I would prefer the liver steak/onions instead of Rita's choice.